15 September 2014 — LOS ANGELES, CA — Through layers of meaning developed through simultaneous and juxtaposed text, dance, postures, costumes, symbolic props, and rhythmic movements with unison, repetition, and layering, Grand Lady Dance House reveals the fury of the often difficult journey to self-actualization as a female actor in the 21st century in Actress Fury. The fast moving, carefully written script by Jennie MaryTai Liu was performed with drive, whim, and vigor by Hannah Heller, Alexa Weir, and Liu at the Bootleg Theatre, Los Angeles, on Saturday September 13, 2014 at 4:00 pm. 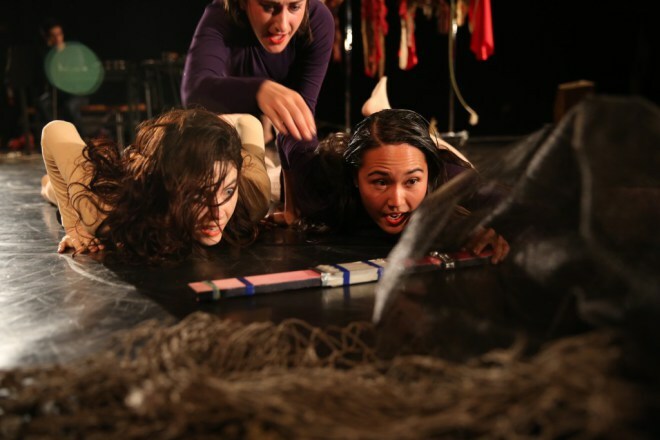 The work, which was supported by Live Arts Exchange and Show Box LA, had been performed previously in various amalgamations at Redcat, Pam/Highland Park, and the Bushwick Starr. This approximately hour-long theatrical work bridges theatre and dance to reveal the extent to what a female actor must travail in order to be secure, successful, and whole in the challenging world of acting. The piece questions what secure, successful, and whole means for a female actor and what one must expect to endure to reach fulfillment. The first scene unfolds with three actors in a dressing room reciting in unison Martha Graham’s exact words from a documentary in which she tells the performer, “It is through you, her love, her hope, her fear, her terror are to be expressed…” Many of the texts used were culled from renowned female actors and dancers who offer advice to young women aiming for a career on the stage or screen. The use of unison monologues using an incantation-like drone represents the woman speaking to herself and to the audience as if to cast a spell; if one talks seriously to oneself enough, one might just believe in oneself. Advice came from Brigit, a woman who started out working in rough conditions, another ends up in a traveling theatre group, another is a pretty chorus girl who everyone objectifies. These women seem to be typecast or given less than appealing jobs within the realm of what could be called theatre jobs. A wooden stake appears repeatedly throughout the show; in the life of a female actor, a wooden stake becomes a dagger, a gun, a sword, a rather lively, comic erection, to name a few. The use of force with the wooden stake reveals that female actors must expect violent and aggressive disembodiments in order to get the job, and female actors must be able to grapple with each of these violent uses of props with sophistication and aplomb, meanwhile while wearing skimpy outfits covered in gaudy sequins. While the messages were overt, blatant, and continuously layered one upon another to excess, the pedestrian-like movements, gestural and gesticulatory dance moves, and human interactions were nuanced, choreographed, and paced with utmost attention to rhythm, timing, expression, and intent. One scene in which cystic bladder disease was discussed at length did not seem to support the progression of the piece as well as the others, simply in its enduring, belabored pace. At times near the end of the work, the overtly loud, animalistic vocalizing and careening seemed to overpower the intent of the monologue taking place. Hannah Heller skillfully transformed her characters, moods, vocal timbre, and vocal range to support diverse characterizations, and she was well utilized in this work for creating character, transforming it, narrating, and dictating commands to others. Her ability to extend her intellectual and emotional persona into the audience was compelling. Alexa Weir’s sensitivity to timing, changes of shaping the body in relation to story, and the depiction of subtle relationships between characters helped create deeper levels of emotional sensitivity in this work. Her supple body folds, flexes, and squeeze through tight spaces one moment and is adroitly quirky and jerky the next.